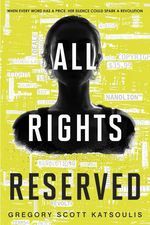 Gregory Scott Katsoulis is the author of All Rights Reserved (Harlequin TEEN), a Summer/Fall 2017 Indies Introduce debut for young adults and an Autumn 2017 Kids’ Indie Next List pick. 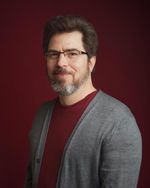 Katsoulis hails from Cambridge, Massachusetts, and is a writer, teacher, and artist. Here, Kaufman and Katsoulis discuss the creation of the author’s dystopian story and its silent revolutionary. Anna Kaufman: What was your starting point for this novel? Did you become interested in the concept of copyright law and then imagine it taken to the extreme, or did you envision refusing to speak as a form of protest and then develop the plot from there? Or something else entirely? Gregory Scott Katsoulis: Many years ago, I became interested in the idea that trademark and copyright law can be used to constrain free speech. The idea that every word would cost money seemed like an enticing concept. The ludicrously commercial and litigious future of the story was born out of imagining what kind of world could allow such a thing. I wrote a full manuscript with a different protagonist and plot, but didn’t strike upon the idea that silence could be a form of protest until I returned to the idea later and re-wrote the entire story from scratch. AK: What were the challenges inherent in telling a story with a central character who, for the vast majority of the book, has no dialogue? GSK: I don’t know what possessed me to torture myself by writing a protagonist who has almost no dialogue throughout the book. I love to write dialogue. But the bigger challenge came in figuring out how Speth would relate to other characters with so few tools at her disposal. Dramatically, however, I found it afforded interesting opportunities. Speth is misunderstood and alone in her decisions for much of the book. Without dialogue or guidance, some of her choices turn out quite poorly. AK: I loved the fact that Speth is a much more reluctant — and in general less action-oriented — young adult heroine than, say, Katniss of the Hunger Games series. Was this a conscious goal or something that arose naturally from the narrative? GSK: Speth’s initial act of defiance in going silent is a form of passive resistance. She responds to a system that is designed to quietly isolate people by making that isolation painfully obvious. I didn’t consciously set out to write a story that was less action-oriented than, say, a teen death-match. I was more interested in exploring ideas and the way human relationships can be harmed by pitiless systems. AK: What metric did you use to come up with prices for different words or actions? GSK: A word market, like the stock market we have now, would be a very complex thing. I imagined it with controls governing how quickly a price can be raised on a word — petitions to override such governance, complex algorithms to project what words will be popular on a given day, and lots of covert control over language to keep people and their ideas in check. I allude to this lightly in referencing the cheapness of an unpopular name like Speth’s, but laying out a full system for the reader would have been painfully dull. AK: What lessons would you like teen activists to take away from this novel, or what advice would you give them? GSK: I hope that any reader will come away from the book with a greater appreciation for both free speech and the power of communication. For teens, I hope that if they identify with the feeling of being silenced, this story will inspire them to speak up. Teens too often go unheard and we need their voices. All Rights Reserved by Gregory Scott Katsoulis (Harlequin Teen, Hardcover, $18.99, 9780373212446) On Sale Date: August 29, 2017. Find out more about the author at gregorykatsoulis.com.